Community Corner - Brighton Bowling and Sporting Clubs. Avoid the rush in getting organized for Christmas. Our Post Office hours include early opening, late closing and we're open on the weekend and public holidays (except Christmas Day). Patterson Road Tatts, News & Post will be open from 8-00am to 12-00md on Boxing Day & New Years Day for all your Newsagency, Lotteries & Post Office needs. 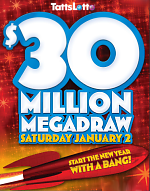 There's a massive $30 Million on offer for the New Year’s Megadraw, Saturday 2nd January. Playing large system entries that offer multiple division prizes is available to you by taking a share in a Megadraw syndicate. Call in today to reserve your share in a New Year's Megadraw syndicate or visit our Megadraw syndicates page online.